Not all portals take you to nice places; some times they lead you to places you never expected. Even worse, you might end up somewhere you definitely didn’t want to go…and you might never get home from. 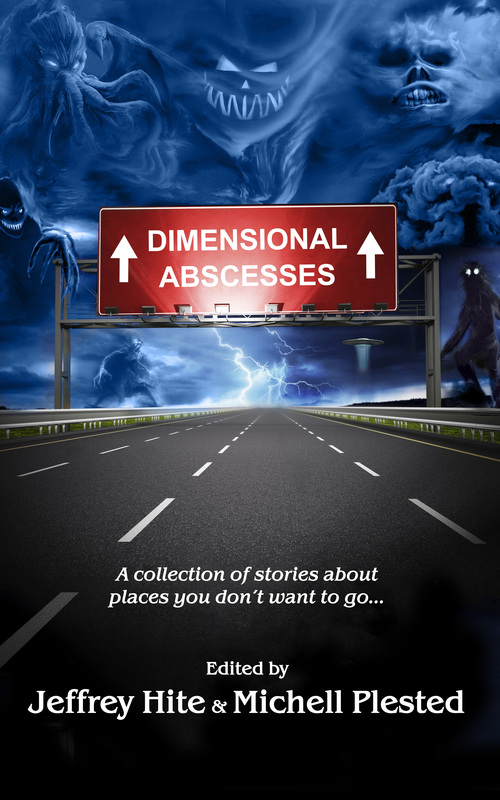 Dimensional Abscesses is a collection of ten stories that explore a few of these “bad” portals. Death the ultimate of headmasters has a test for Mother Nature. If she passes she will finally get that finally piece to her project, but if she fails it could mean the end to all life in the system. Nature stood, her arms to her sides, on the edge of the eternal field high above creation and waited. This was the third time in a month she had been called here and she was getting pretty darn tired of it. It was not like she had all the time in the world. She really did have things to do, papers to write, undergrad tests to grade and articles that her colleagues were begging her to read and get back to them about. It seemed unfair that she had to keep coming out here. Most boys didn’t get to come back from the war walking on their own two feet. Some of them came back, but they were mostly wrecks. But, most of them came back in boxes if they came at all. But not Joe. Joe came back into town with a smile on his face. He had gotten a lift from the station and the driver had dropped him off right at the edge of town. When we first spotted him, he was adjusting his uniform getting ready to make his big entrance. The the Earth sent out colony ships thousands of years before, they always hoped that some would come back and let them know how they fared. When they do come back the job of greeting them falls to Roger. Some times they hostile, and some times they are not. Sometimes they don’t even speak the language. As he watches the final decent stages of the latest visitor they have to wonder what will today bring. A Method to the Madness: a Guide to the Super Evil, will release July 1, 2013 in both trade paperback and eBook, and will be available through online booksellers globally, as well as directly from Five Rivers. Her Serene Omnipotence Calassandra, Conqueror and Empress; Janus Kinase Hateyuaniwae, BFA, PhD, PhD, FRCCP, P.Eng;and Dr. Evil-n-Carnate, Frequent Flyer, Grocery Shopper and Overlord Of Cubical Block 3257J – to name but a few. Between the 24 sages who assembled at the North American Conclave, they created insightful papers on the pressing subjects of Cognitive Perspective in the Pursuit of Evil; Principles of Biology and Genetics for Minion Breeding Programs; and, The Importance of Date Night to the Married Super Villain. At the end of the forth century, even as their empire crumbles around them, the Romans continue to push north and the smaller tribes are starting to get desperate. The three villages that inhabit a valley north of Trier discover something that might save them before they are completely over run. But their safety might come at a high price. In 2047 humans finally left the Earth. In 2059, when the First Martian Colony claims independence, they find that even the vast gulfs of space won’t stop them making war on each other. Crewman Marcia (Long Island) March is new to the Earth battle fleet, and already she is having trouble. The lump in her mattress is making it hard for her to sleep, but her bunk mates and the officers on the Petra all think she is crazy. When her OOD finds her in the head after lights out she realizes this is going to be a long voyage for her. It will be an even longer one for the crew of the Petra when they learn how dangerous that lump is to all of them. The Earth Martian war has taken it’s toll on Captain Samuel Jonas. Newly retired from the fleet his first job out as Captain of the San Juan is not quite the job he was hoping it would be. Some demons even time can’t erase. Mr. Johnson and his one and only subject have had a very happy and successful existence thus far. Today that will all change.